Yesterday was Rav Meir Kahane's yahrzeit. Last night the annual memorial was held in Jerusalem. Unfortunately, I wasn't able to be there. You can see some pics from the gathering here. The average Jew is sublimely ignorant, comfortably materialistic, stupendously blind, a man utterly lacking in understanding and faith. The practitioner of ritual, the ostensibly “religious Jew,” defies the injunction to live in the Land of Israel and embraces the pagan and unholy earth of Exile. BTW, Fishman also has a real schlager of a Halloween post. 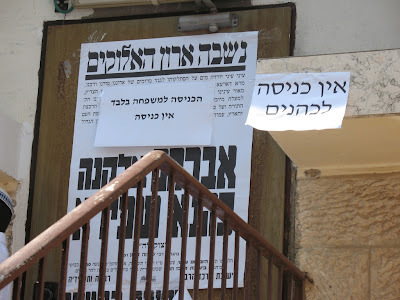 Last Sunday there was a gathering at the Merkaz HaRav Yeshiva marking 30 days since Rav Shapira's passing. Rav Yehoshua Magnes, Rav Shmuel Shapira, Rav Yaakov Shapira, Rav David Chai HaKohen, Rav Tzephaniah Drori, and Rav Shlomo Dichovski delivered eulogies. I wasn't there, but the guys from Yeshivat Beit El were! They put up the eulogies on their site. God bless 'em! Peace unto you, and peace unto your poodles that leave their aromatic sandal mines on the sidewalk. 12 Arabs who were arrested on Monday for allegedly uprooting 3,000 vines from a Jewish vineyard near Neria last week have confessed to the crime, police said Monday night. Police did not say what evidence led them to arrest the Arabs. Three British women were arrested over the weekend for participating in the same crime. The women were volunteers with the militantly anti-Israel International Solidarity Movement, a group that brings foreign leftists to Arab cities in Judea and Samaria in hopes that the leftists’ foreign citizenship will allow them to assist local Arab anti-Israel groups with impunity. See also this post at Israel Matzav and this post at Smooth Stone. 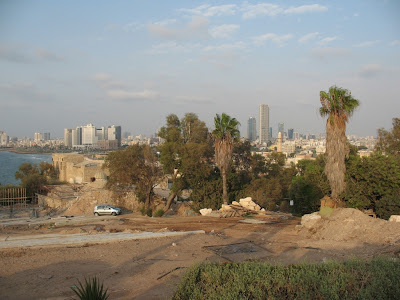 A while back I blogged about commuting to Tel Aviv. Thank G-d, I don't commute anymore! My company transfered me to Jerusalem, after I cried, begged, threatened to quit, etc. The Tel Aviv experience was an eye opener, I must admit. From the short time that I worked in the city, I truly feel that Tel Aviv is in the midst of a Teshuvah process. If you don't believe me, check this out. Tel Aviv is slowly but surely becoming a more observant city. That's what I call the passage from Rachel Imeinu's yahrzeit to the yahrzeit of Yitzchak Rabin. Here's a good article about Rabinfest. See also, The Festival of Hate. And last but not least, be sure to pay your respects at The Church of Rabin And Peace. Once a woman came to the beit din (rabbinical court), and before the judges said to her husband, "You divorced me." In such a case, according to Jewish law (Even HaEzer 17), we believe the woman. However, the case seemed strange to the judges. The judges were perplexed, and they were not sure if they should believe her. One of the judges was HaRav Ovadiah Yosef (may he live a long and good life), and he said immediately, "Call Rav Avrum Shapira." Rav Shapira entered and heard the problem. He turned to the woman and said, "Tell me, when you married your husband you circled him seven times. When you divorced him how many times did you circle him?" The lady replied, "Three times." "Thank you very much," said the Rav. "You were never divorced, since there is no such custom. In this way the Rav, with his great wit, saved the rabbinical court from a conundrum. Yeshiva.org.il, the internet site of the Beit El yeshiva deserves a big yishar koach. Thanks to them, you can now see videos of many of the eulogies that were said for Rav Shapira, some of which I blogged about. Check it out! Rabbi Shapira had sons that had reached the age to get married, and he was trying to find them suitable brides. He asked a somebody if he knew of anyone suitable, and the person asked the Rav exactly what kind of girl is he talking about. The Rav responded that the girl must have middot tovot, good character traits. The person than inquired if the Rav also required that the girl have yichus, a prestigious family line. Rav Shapira replied using his great humor saying,"You bring the girl with good middot, and I'll bring the yichus!" Let's hope that this is the start of a nice rainy winter. Rabbi Shlomo Amar visited the Chicago area and Yaak was there. 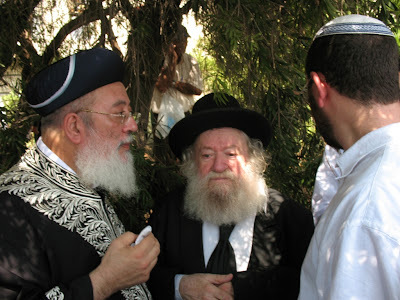 Rav Amar was one of the Rabbis that eulogized Rav Shapira at his funeral. A yeshiva student saw him and blessed "shechalak mechomato levasar vadam". Rav Amar expressed his displeasure with the student and told him that although he does know much Torah, he has not reached the level where that blessing can be said on him. He added that there are only two people in the generation that are on that level: HaRav Avraham Shapira (who recently passed away) and HaRav Ovadiah Yosef (sheyibadel lechayim arukim). Many important rabbis came to the Merkaz HaRav yeshivah to eulogize Rav Avraham Shapira zt"l. Among them was Rav Ovadiah Yosef, sheyibadel lechayim arukim. I don't always like the politics of Shas, but it is always a thrill to see this Torah giant. He spoke of Rav Shapira's love for the Torah and his greatness as a rabbinical judge. He encouraged the students to increase their study of Torah in order to fill the void caused by Rav Shapira's passing. 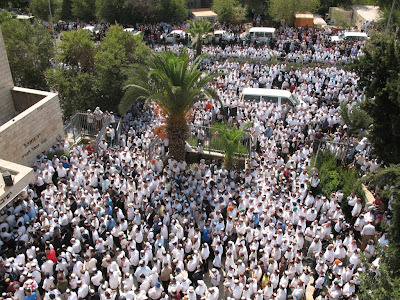 Update: Here's an article in Hebrew about the gathering. Rav Zalmen on the yeshiva: "I want the students to learn Talmud in depth like they do in the "Lithuanian" yeshivot, to be happy as the students in the Hassidic yeshivot, and to be able to decide halacha (lifsoq halacha) like the Sephardim." I just read a terrible "eulogy" of Rabbi Shapira by an guy named Lawrence Joffe. It is filled with many innaccuracies, if not outright lies. A quick "Google" on Lawrence Joffe reveals that he is "a London-based writer who specializes in Middle Eastern politics and culture." After digging a little deeper I discovered that he is not just a writer, but a member of the British Friends of Peace Now. Now that we know who this "London-based writer who specializes in Middle Eastern politics and culture" is, we can understand why he penned such a vile article. Israel's Ashkenazi chief rabbi (1983-93), Avraham Shapira who has died, aged 94, was a champion of the settler movement, a revered adjudicator of Jewish law - and one of Israel's most divisive religious figures. Rav Shapira was not divisive at all. 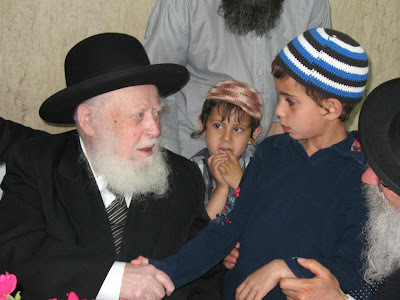 He was a true Torah scholar, Chief Rabbi, full of love for every Jew regardless of his religious observance. Still active into his 90s he won notoriety - even among fellow Orthodox Jews - when he urged soldiers to disobey orders to evacuate the Gaza Strip in 2005. Shapira believed that the territory Israel had won in 1967 was promised by God and belonged to Jews in perpetuity. "Surrendering" an inch of sacred turf was tantamount to blasphemy, he felt. The surrendering of land was wrong because we are commanded to settle the land. Rabbi Shapira also warned that surrendering land endangers Jewish lives, and history has proven him right. Only the wicked would deem the fearless instruction of Torah principles as "notoriety." While such views are commonplace in rightist circles, Shapira's willingness to defy the army signified a huge breach within Israel's "national religious" camp, especially coming from such an establishment figure. His proteges traditionally encourage military service as a patriotic duty. Given that most NCOs now come from Israel's observant minority, the rabbi's stance seemed all the more corrosive. In December 1993, the late Rabbi Shlomo Goren, a former Chief Rabbi of Israel and Chief Rabbi of the IDF, published a ruling forbidding Jews to evacuate any settlement in the biblical Land of Israel, which includes Judea, Samaria and Gaza, and declared that Israeli soldiers should disobey any such evacuation orders. He declared that "according to halakhah [Jewish law], a soldier who receives an order that runs contrary to Torah law should uphold halakhah and not the secular order. And since settling the land is a commandment, and uprooting the settlements is breaking the commandment, the soldier should not carry out an order to uproot settlements." 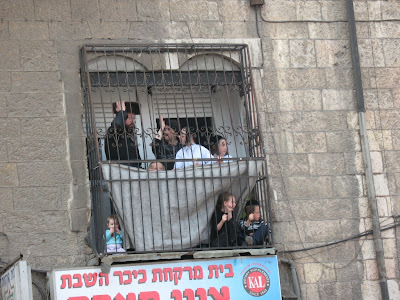 In April 1994, discussion of possible evacuation of the Jewish residents of Hebron caused a number of rabbis, including Chief Rabbi Avraham Shapira, Rabbi Moshe-Zvi Neria of the Bnei Akiva movement, and Rabbi Shaul Yisraeli, to direct soldiers to reject any order to evacuate Jews from Hebron or other settlements. Shapira invariably warned against violence, and in 1995 he had condemned Yitzhak Rabin's ostensibly religious assassin as a man "without conscience or Jewish morality". Even so, his 2005 edict sparked fears of civil war. One Labour party legislator wanted him tried for incitement to rebellion. In the event only 40 soldiers obeyed his call. The disengagement passed with considerable ideological pantomime and sad tales of personal upheaval, but no serious casualties. None the less, opposition leader Yossi Beilin felt Shapira had misled an entire generation by hinting that divine intervention may stop the process. When the pullout did happen, it left behind the "biggest spiritual crisis in years". Did Shapira's edict spark fears of a civil war? Joffe should check out some of these "edicts". It seems that either Beilin or Joffe are confusing Rabbi Shapiro with Rabbi Mordechai Eliyahu, who said, "Hayo Lo Tihye"(it will not be). Some interpreted this as a promise, even though Rabbi Eliyahu explained before the disengagement that this was not his intention. Gaza was not Shapira's first foray into politics. Soon after leaving the chief rabbinate he co-founded the Rabbis' Union for the Complete Land of Israel. Its 500 clerics attacked the Oslo Accords for transferring land to Palestinians - forbidden under Jewish law, they claimed. In 2003 Shapira asked the Knesset to boycott a ceremony honouring the International Fellowship of Christians and Jews. American evangelicals, he claimed, were deceiving Jews and Christians into imagining a "common faith shared by both". Hmmm, suddenly Joffe remembers that Rabbi Shapira's decision that giving up parts of the land of Israel is against Torah law predated the ethnic cleansing of Jews from Gaza by many years. Not only that, but 500 other Torah scholars, that Joffe disingenuously refers to as "clerics" agreed with him. 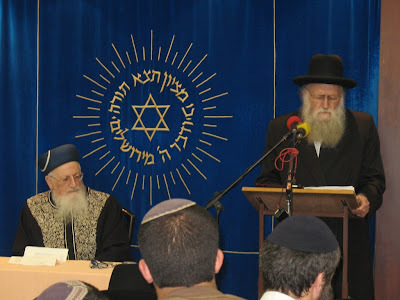 Shapira inspired thousands as dean of the Mercaz Ha-Rav Kook Yeshiva, one of Israel's largest talmudic academies and the flagship of religious Zionism. He probably wielded more influence in that post than as chief rabbi, as most settlement rabbis are Mercaz graduates. Many national religious Jews, who make up two-thirds of Israel's 12% observant minority, considered Shapira the gadol ha-dor - greatest authority of his generation on Jewish law. In terms of religiosity, among Israeli Jews aged 20 and over, 44 percent defined themselves as secular; 27 percent defined themselves as traditional; 12 percent as traditionally observant; 9 percent as Orthodox; and 8 percent as ultra-Orthodox. 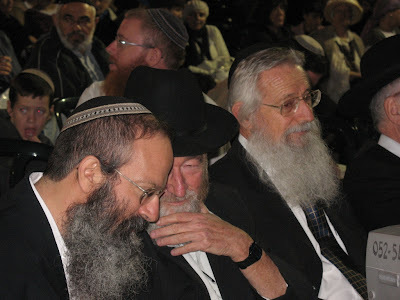 Jewish society in Israel today is made up of observant and non-observant Jews, comprising a spectrum from the ultra-observant Haredim to those who regard themselves as secular. However, the differences between them are not clear-cut. If religious observance is determined by the degree of adherence to Jewish religious laws and practices, then 20 percent of Israeli Jews fulfill all religious precepts, 60 percent follow some combination of the laws according to personal choices and ethnic traditions, and 20 percent are essentially non-observant. But as Israel was conceived as a Jewish state, the Sabbath (Saturday) and all Jewish festivals and holy days have been instituted as national holidays and are celebrated by the entire Jewish population and observed by all, to a greater or lesser extent. 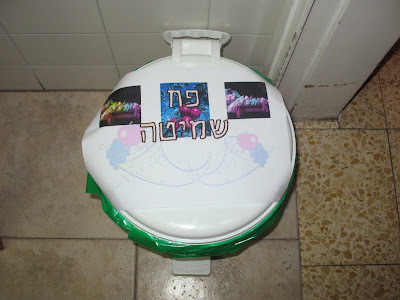 Shapira's tenure at Mercaz was not without incident. Rabbi Tzvi Tau, seen as an obvious spiritual heir, resented being bypassed as rosh yeshiva. Eventually Tau left Mercaz in 1997 to form the more philosophically engaged and Bible-focused Yeshivat Har ha-Mor. Shapira preferred students to study Talmud and halakha (Jewish law). The final straw came when Shapira accepted a state-backed diploma programme at Mercaz. Pure nonsense! Talmud, Bible, and Jewish philosophy are learned at both institutions. He was born in Ottoman-ruled Jerusalem. His parents were of European origin and were Jews with deep roots in the holy city. He studied at Jerusalem's Etz Haim (Tree of Life) and Hebron Yeshivas. As his scholarly reputation grew he associated with leading Talmud sages, Yitzhak Ze'ev Soloveichik, Avraham Yeshayahu Karelitz, and Rabbi Moshe Feinstein. If my memory is correct Rav Shapira is a sixth century Jerusalemite. His ancestors were among the students of the Vilna Gaon, who at the urging of their teacher came to settle the land. How many generations does one have to live here to be considered of "Israeli origin?" There's more, but I'm tired of fisking. Rav Shapira zt"l was a blessing to the Jewish people. That's a lot more than I can say about those creeps who sit in London and preach territorial concessions to Israelis. The amazing Mr. Bagel does it again. Yoram was a nice guy. You can see a picture of Yoram here. 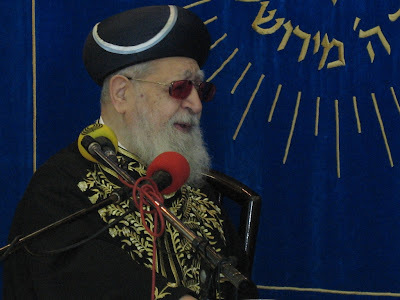 The passing away of Rav Avraham Shapira zt"l has made it very difficult for me to be happy. Sukkot is z'man simchateinu, the time of our happiness, but the tremendous loss of this great Torah scholar and righteous man has cast a shadow on the holiday. Also, check out what Tzvi has to say. Update: Here's an article in Hebrew describing some of Rav Shapira's Hanhagot. The article mentions the very special arba minim that Rav Shapira had including a huge Yemenite etrog. I would like to add that after davening Rav shapira would let his students and others who had davenned with him notel his arba minim. I did it a few times myself.